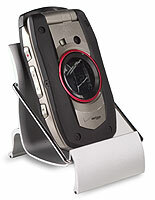 What benefits are there in using cell phone stands in your promotional business displays? These aluminum and plastic smartphone holders come in several styles and with certain features that are ideal to be used in presentations of mobile accessories. The iPhone mounts are made to be universal or include many cords to work with many models of handheld Android devices. 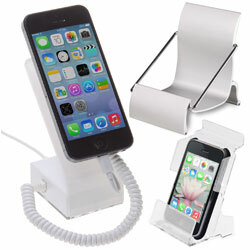 The cell phone stands, such as smartphone mini holders, are not only able to keep technology easily accessible, but will also keep retail displays organized. There are even models that will arm iPhones and other models with alarms to help prevent theft of the expensive units. The smartphone displays for desks offer the ability to charge devices while they are being protected by the secure mounts. The universal cell phone stands will always present Androids that are ready to use, making it much easier to sell the communication tools. What are the styles that available in these smartphone mounts? These cell phone stands are sold with one option being the big divider and that is security. There are basic iPhone displays that are made of clear acrylic or silver aluminum that have no alarm, but are able to hold the technology upright for better viewing by customers or owners. The other cell phone mounts are those stands that come with alarms and these are all made of plastic or acrylic. These holders are sold individually or in sets to accommodate 4 different units at a time and are chargers as well to keep batteries ever full. These platforms are universal and versatile iPhone displays that are affordable for home, office, or promotional use. The truth is that in this day and age everybody, even young children, have handheld technology that they use on a regular basis. The Android devices are taken with us everywhere and are also vital tools seen on my work desks. So it stands to reason that everyone needs a cell phone mount at some point. The stands without alarms make sense for home use because they are less cumbersome and also less expensive, but just as useful. How many times has it taken you more than 5 minutes to find your lost iPhone? Why waste valuable time searching for it when it can be placed on a display that will keep it in the same place by your front door, purse, or on your night stand. Offices use mini holders for many of the same reasons that home users to, which is really to keep handheld communicators within easy reach. With a mount that keeps the device upright, employees don’t even have to stop what they are doing to see if the call is important enough to take or let it go to voicemail. Units with alarms can be used around the office for added security with the benefit of the anti-theft systems having built-in chargers.